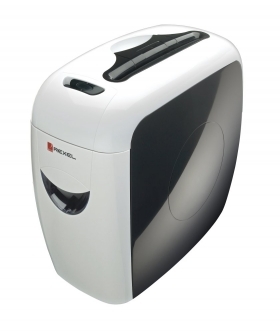 With its stylish black and white design, the Rexel Prostyle Shredder is the modern, compact solution for destroying confidential information and a popular choice with busy company executives and professionals working from home. Whether you want to protect yourself from identity fraud or avoid leaking sensitive information, this high security, confetti-cut shredder will destroy documents quickly and easily. And that includes credit cards, staples and paper clips too. High performance steel cutters slice documents across their length and width for a superior level of security. From customer details and medical records to credit card statements and personnel files, you can reduce confidential papers to confetti-shaped pieces of 4 x 35mm in seconds. This highly efficient shredder can handle up to 12 sheets at a time, including fiddly staples and paper clips, so you don’t waste valuable time removing them by hand. It can even destroy credit cards and make them impossible to reassemble. Small and compact, the Rexel Prostyle Shredder will fit neatly under a desk so you can use it without getting up from your office chair – particularly useful if you need to shred documents frequently. The pull-out bin is easy to empty and a clear window shows when it’s nearly full to avoid over-fill and jamming. With a generous 20-litre capacity, this bin can cope with up to 200 sheets so you won’t need to empty it too often. The advanced induction motor ensures ultra-quiet operation. This makes the Rexel Prostyle Shredder ideal for individual use in modern, open-plan offices or departments handling complicated information where high levels of concentration are required.